M. Evelyn McCormick was born in Placerville, CA on June 16, 1869. McCormick moved to San Francisco with her family as an infant. There she later studied at the School of Design under Carlsen, Williams, and Yelland. At that school a love affair with artist Guy Rose flared and continued while both were in Paris at Académie Julian. The pair painted in Giverny before returning to San Francisco in 1891. During the late 1890s she maintained a second studio in Monterey. Her affair with poet Charles Warren Stoddard in 1895 produced an illegitimate child who grew up to become artist Otheto Weston. After the earthquake of 1906, McCormick moved to the Royal Hotel in Monterey and established a studio on the second floor of the Custom House. At the opening of the Del Monte Gallery in 1907, the critics compared her work to that of Hassam and Monet. An Impressionist, she specialized in oils of Monterey’s historic buildings and adobes. McCormick was commissioned by the city of Monterey to paint depictions of twelve local buildings in the area; these works now hang in the Monterey City Hall and other public offices. A spinster, she died at the Royal Hotel on May 6, 1948. Member: San Francisco Art Association; Carmel AA; Sketch Club (SF). Exh: Calif. State Fair, 1881, 1901; Paris Salon, 1891; San Francisco Art Association, 1892-1916; Berlin, 1891; World’s Columbian Expo (Chicago), 1893; Mechanics’ Inst. (SF), 1892; Calif. Midwinter Int’l Expo, 1894; National Academy of Design (New York City), 1896; Del Monte Art Gallery (Monterey), 1907-12; Panama-Pacific International Exposition, 1915 (bronze medal); Calif. Artists, DeYoung Museum, 1915; Gump’s (SF), 1924; Golden Gate International Exposition, 1939. Works Held in Public Places: UC Berkeley Museum; Monterey Peninsula Museum; Los Angeles County Museum of Art; Metropolitan Museum. 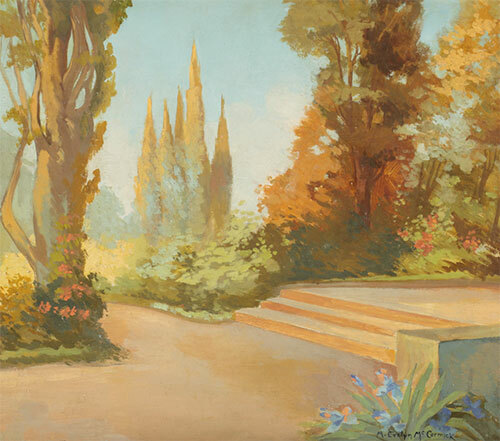 Dictionnaire des Peintres, Sculpteurs, Dessinateurs, et Graveurs (Bénézit, E); Art in California (R. L. Bernier, 1916); Artists of the American West (Doris Dawdy); California Impressionism (Wm. Gerdts & Will South);American Art Annual 1903-17; California State Library (Sacramento); Women Artists of the American West; Death record; Monterey Peninsula Herald, 5-7-1948 (obituary).